I’m so glad you’re here! Have you ever needed to charge your cell phone somewhere than you normally do? Just wait until you see the Cell Phone Charging Station we’re going to make today! Do you reuse what you can? Do you like to recycle? Is it something you are teaching your kids to do? We do recycle. But, we don’t spend a lot of time doing it. We have a recycle bin under our kitchen counter that collects tin and aluminium cans, glass and plastic containers. Every two weeks, we sort it into the recycle baskets and set it out with the trash. Mr. Napping takes our cardboard to work and recycles it there, since we can’t do that from our residence at this point. We spend less than 20 minutes a week in our recycling efforts, but we are still reducing waste that would otherwise end up in the landfill. I also re-use empty containers and things around our home. Old spice bottles makes great maracas. Empty toilet paper tubes are fun to make into play binoculars, race cars and rain sticks. Empty, clean tin cans are great for organizing pens, pencils, crayons and other art supplies. 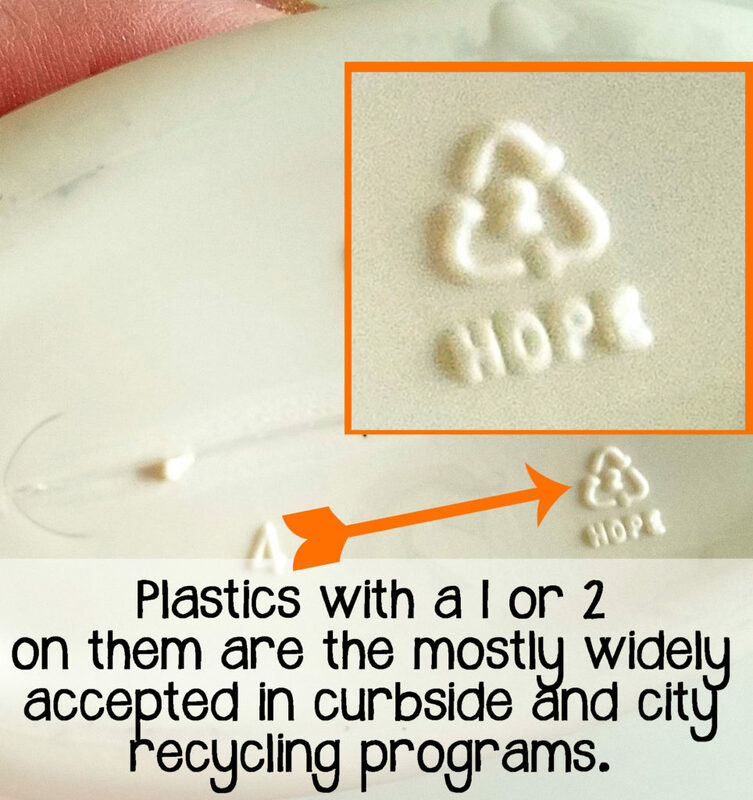 Reusing these items are just as much for the sake of fun, and recycling is just a bonus! There’s lots of things you can repurpose and reuse. And what you can’t reuse, you might be able to recycle. Most recycling is done in the kitchen. Have you ever thought about recycling in the bathroom? A 2016 consumer survey on in-home recycling habits, conducted in partnership with Johnson & Johnson Consumer Inc., shows that 34% of regular recyclers admit that it never even occurred to them to recycle in the bathroom! They found one of the main reasons people don’t recycle personal care products in the bathroom is a lack of tools and resources; only one in five recyclers have a recycling bin in their bathroom. We don’t! Do you? Johnson & Johnson Consumer Inc. have created the Care To Recycle® program to encourage recycling of personal care product packaging and as a gentle reminder to extend your recycling habits outside your normal areas. Care To Recycle® wants to help parents extend recycling habits outside the kitchen and into the bathroom. We can involve our children in the fun and ease of recycling and reusing. 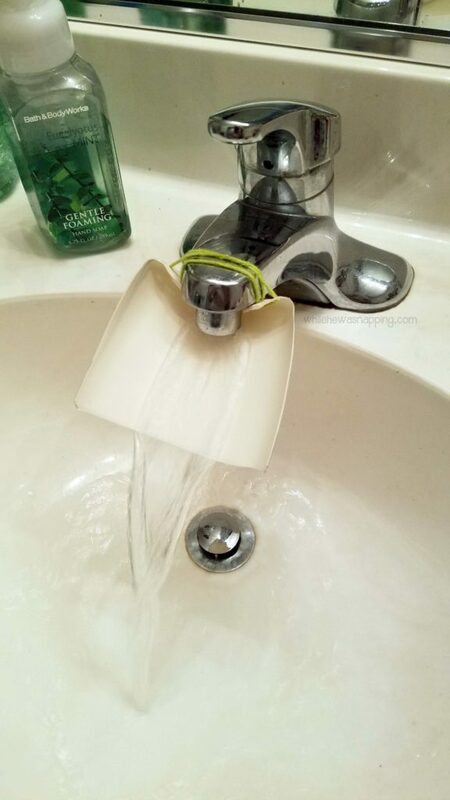 Here’s a fun, quick and easy little project that will help you reuse and recycle things you use in the bathroom. – Empty plastic bottle large enough to hold your phone. I used an Aveeno lotion bottle. 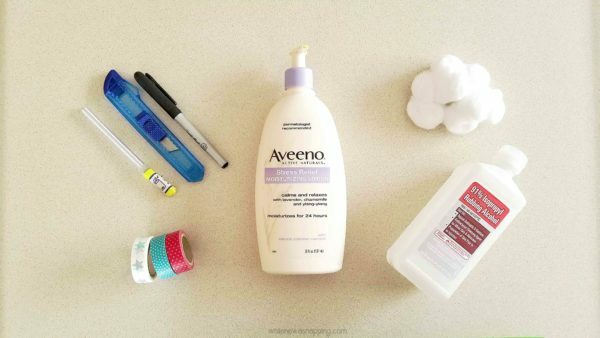 The stress relief lotion is amazing (because as a mom of three boys, I have stress. Lots and lots of it). The bottle is a great size for reusing. If you don’t want to reuse it, it is recyclable. – Scissors, Razor Blade and Craft Knife. You can get by with just one, but I ended up using all three of them. – Start by washing out your empty bottle. Get out all the gunk and goop. Keep rinsing…. Almost there. Great, it’s goop-free now. Here’s a video of the next five steps. Watch me do this project in less than a minute and a half. Or read through the directions below. If you get confused, come back and watch the video. – Remove the label. The lotion bottle I used just had a sticker label. It took a little coaxing on one corner – we’re talking like maybe 30 seconds tops – but the label came up relatively easy. If you can’t get it off or don’t want to deal with it, you’ll be covering it up in a few minutes. Taking the label off just gives you a cleaner, less textured surface to deal with when you’re covering your bottle. – Use the rubbing alcohol to clean off any sticky residue left behind by the label. – Take the permanent marker and draw the basic shape of the area you want to cut out. You will need enough space to put your phone into and take it out of the container. I opted to turn the bottle upside down and thread the USB charging cord up inside the bottle opening. If the majority of the cord is inside the bottle, hopefully it won’t get pulled on, played with or caught on anything and damaged. You could leave the bottle upright and just drop the cord in the bottom too. – Then I thought It might be nice to be able to hang the charging station on the plug and keep it all together that way. I cut a hole in the back of the bottle large enough to put my plug through. – You can go back over any stray permanent marker lines and clean them off your charging station with rubbing alcohol. Wax on, wax off and you’ve got yourself a clean bottle again. – Now, it’s time to get fancy. 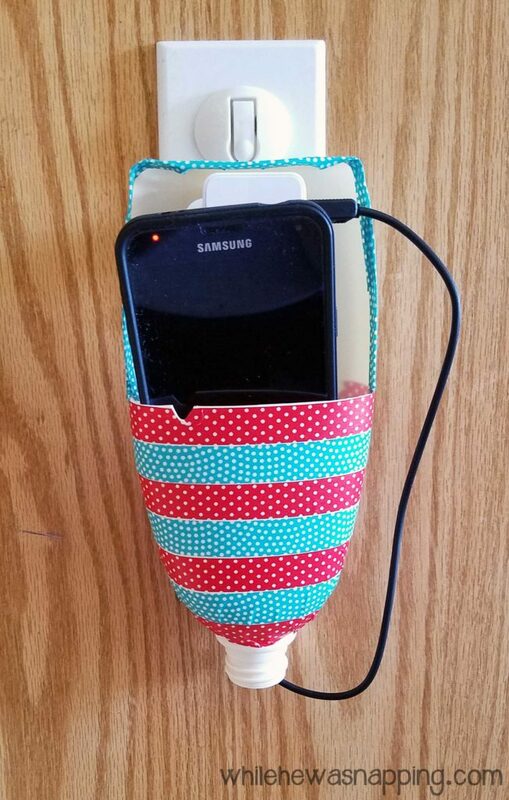 I didn’t want just a boring charging station hanging around, so I used some washi tape and stuck it to the bottle. I only did the front, but you could do the whole thing if you wanted. I like washi tape because it’s easy to use, it’s simple to make adjustments if you make a mistake and it’s easy to remove if you ever decide you don’t want it anymore. You can still recycle the bottle that way. That’s it. Your cell phone charging station is ready to use! What I really love about this is that there are so many possibilities! And, I turned the cut out part of the bottle into a sink spout extender in our bathroom so Little N can wash his hands without needing to be held! Double score! Do you have any great repurposing hacks? Leave a comment and tell me about it!